After 6 Weeks. . .
We think Norah is officially over her finger sucking habit! I say, ‘think,’ because we obviously don’t really know what she does in the middle of the night. She doesn’t put her fingers in her mouth at the times she used to – when she is tired, watching TV, in the car, when she is hurt, etc. I have even napped with her a couple of times and she hasn’t even tried! Yea! Shawna’s house (Kev’s brother & SIL) and we took Norah to the mall. She was very excited to pick an animal – of course, she chose a PINK leopard. She was amazed at all the clothes to choose from (actually we were, too) and ended up picking a denim skirt that is similar to one she has and a purple shirt and leggings. We finished our little outing with cookies from the Great American Cookie Co. Yummy! Between computer issues and just feeling too tired, I haven’t blogged about anything fun recently. So here we go! The girls are in their “new” bunk beds! We bought them off of Craigslist a couple of months ago. They were a light wood which I probably could have learned to like, but the great (and handy) husband that I have knew that I had my heart set on white. He spend the last several weekends stripping, sanding, priming and painting – and they look fabulous! He did a great job! We debated whether to put the girls to bed at the same time or put one down earlier and one later. Typically, Lucy talks/sings herself to sleep (this has been her routine ever since she could carry a tune) and Norah falls asleep instantly. 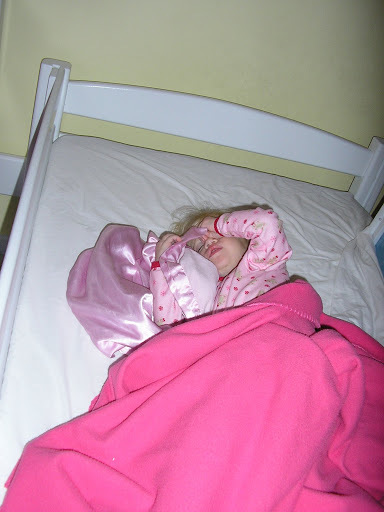 It doesn’t seem right to put Norah to bed first, since she is older, but if we put Lucy to bed first, it could take a LONG time for her to fall asleep. So, we have put them to bed at the same time and so far it is working great. The first night both girls were exhausted so they both fell asleep right away and they both slept until 7 (unusual for Lucy – her typical time was 6:15 or 6:30). The second night Lucy was singing and we heard one loud “SHHHH” from Norah (we temporarily put the monitor in their room – mostly for our own entertainment). Lucy continued to sing, but both girls drifted off fairly quickly. Last night, they giggled and talked for about 20 minutes. At one point Norah was singing and when she stopped, Lucy said, “Norah, do that again.” Kevin went up one time to remind them that it was bedtime – and we didn’t hear another peep. 7:00 has been their wake-up time this week – I love that! So far so good. I know we will have some nights that aren’t so great, but I am happy with how well they are doing for now. Naptime has been a little more difficult partly because Lucy is so excited to be in a new bed. I have to take the ladder to the top bunk out of the room during naptime. Lucy won’t stay off of Norah’s bed and this morning she had actually climbed on the outside of the rail to the top bunk. Next thing I know she will be jumping from Norah’s bed to her bed. Ha! 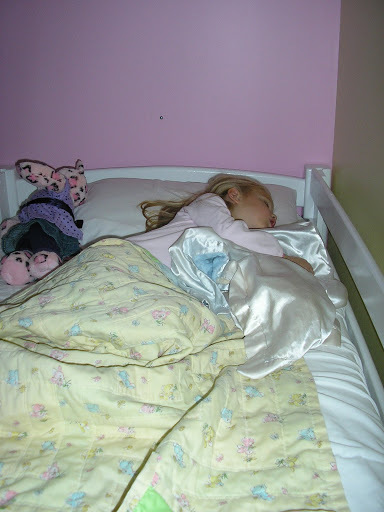 I realize that my pics don’t actually show the beds – just proof that they are sleeping. I will try to get a picture of the beds to post. While I have several fun things to post about (Norah is no longer sucking fingers! We moved girls into their new bunkbeds!) I am too tired to upload pictures and write a lot. However, I could use some advice. Lucy has totally regressed when it comes to the potty training. She is having accidents all the time – not even just one a day. She is probably having more accidents than she is actually going on the potty. If I remind her then she will go (although today I was helping her pull her pants down to sit on the potty and she peed right there on the floor), but if it is up to her – like at MDO, Bible study, or church, she just goes in her pants. She also doesn’t seem to care – she actually laughs when she sees that I am frustrated! She has also started going in her car seat and tells me after the fact – even after she just sat on the potty before we left. Yesterday we were going to Kevin’s brother’s – about 40 minutes away. We had to stop about 20 minutes in so she could go potty. She had been holding it for hours if we were in the car. Anyway, anyone have any advice? Being so tired doesn’t help my attitude about it, but it is driving me crazy!! I think Norah has skipped a few years and is nearing 13 or 14. She has been a little obsessed recently with how old you have to be to be a teenager. She often asks if she has to be a teenager to do certain things. Last night, she and I ran to Kohl’s to do a little shopping. I could use some black pants – I think with the girls I had borrowed from someone else. (I had no luck by the way). I thought we would look at the Christmas dresses for Norah. Plus, we did a little Christmas shopping there too. I had a 30% off coupon so I figured we should do what we can. While we were at Kohl’s, Kevin and Lucy were at Circuit City. Norah said at one point, “Girls don’t like shopping for computer stuff – only clothes.” She is at a fun age to take shopping because she enjoys it, but I still have the final say over what she picks out – and she’s okay with that. I know that won’t last forever. I know it’s normal – to be this tired during the third trimester – I just don’t like it. I think I have hit the fairly normal end of pregnancy insomnia. Some nights I sleep great – other nights, I hardly sleep. Some days I nap, some days I feel like I have too much to do to nap. Today, I was laying with Norah – who isn’t feeling very well. I actually fell asleep and she did not. I woke up to her just sitting next to me – staring at me. I had a doctor’s appt. yesterday – everything seems great! It’s hard to believe that we only have 11 weeks to go! We have so much to do before this baby comes!! The girls still are not in their bunk beds, yet. Kevin is refinishing the beds that we bought – we are hoping one day next week!! I have been feeling the baby move constantly and just like with Lucy, this baby seems to settle under my right ribs. I realize that because I am short, there isn’t a lot of room for the baby, but seriously. It’s like this baby sticks a body part – arm, foot, I don’t know – right under my rib! Norah felt the baby move this week – that was the highlight of her week!! Just wanted to put the bug in your ear to this GREAT website for teaching Spanish to your children! I’ve seen brief snippets of it – my brother is the creator – and it is excellent! As with any early childhood program – the earlier a child begins something, the better! Foreign Language Friends will launch on January 12, 2009, but check out the website now to read a little about it! We will be making it apart of our homeschool experience! !